River Court was designed to accommodate a spacious roof deck offering spectacular views of the ever-changing panorama of the city. 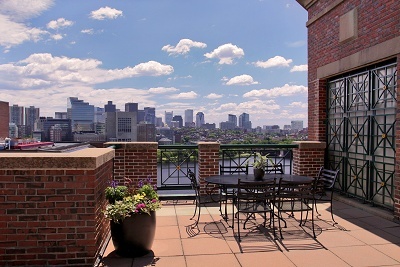 The roof deck is a perfect spot for sunning or viewing the events on the Charles River. The roof deck is open during the warm weather for use and enjoyment by all residents and is a favorite place for residents to watch the 4th of July fireworks extravaganza. Tables, chairs and benches are available for your use. You may also bring your own chairs, etc. although we ask that you remove all personal items when you leave the deck. Feel free to have a picnic on the roof. However, in order to protect the roof membrane, glass and smoking are not permitted. Per the order of the City of Cambridge, grills are also prohibited. We ask that you please use caution and consideration for your neighbors when using the roof deck. Please review the Rules & Regulations for use of the roof deck prior to use.